This ancestor webpage is under development and incomplete. when this webpage is complete. Louis David dit Saint Michel, the 7th son and 10th child of Jean Pierre David and Marie Madeleine Monmillion, was born on 02 September 1732 at Louisbourg and baptized the same day. His godfather was Sieur Louis Levasseur, Lieutenant General of the Admiralty, and his godmother was Dame Anne Lefron, wife of Monsieur Benoist, ensiegne of Company aide to major of troops of this garrison. Fre Zacharie Caradec, Recoleta Vicar General, Commissioner of Missions of Île Royale and of St. Jean, Parish Priest of Louisbourg, presided at the baptism. Witnesses attending the baptism were Margaret Depre. In 1733, Jean Pierre and Marie Magdelaine tragically buried 2 additional children with the deaths of their 1st daughter, Magdeleine, on 09 February 1733 at the age of 12 years and Etienne Thomas on 01 April 1733 at the infant age of 2 years. 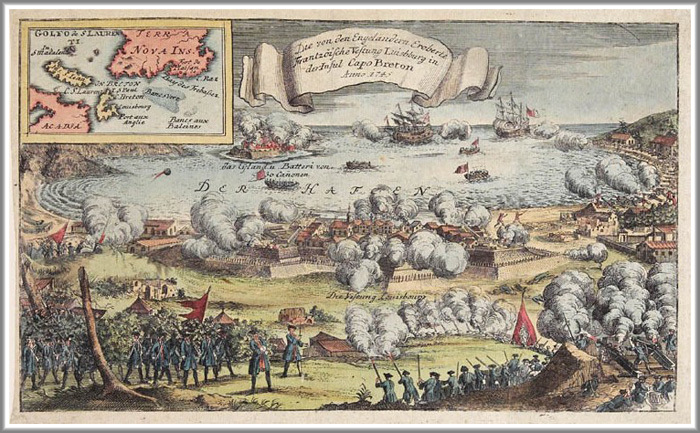 The last 5 of Louis' siblings to be born at Louisbourg were Claude Thomas born on 20 December 1735, Jacques Andre born on 30 November 1737, Jeanne Olive born on 10 July 1739, Marie Magdeleine born on 16 January 1741 and Jeanne Angelique born on 21 December 1743. 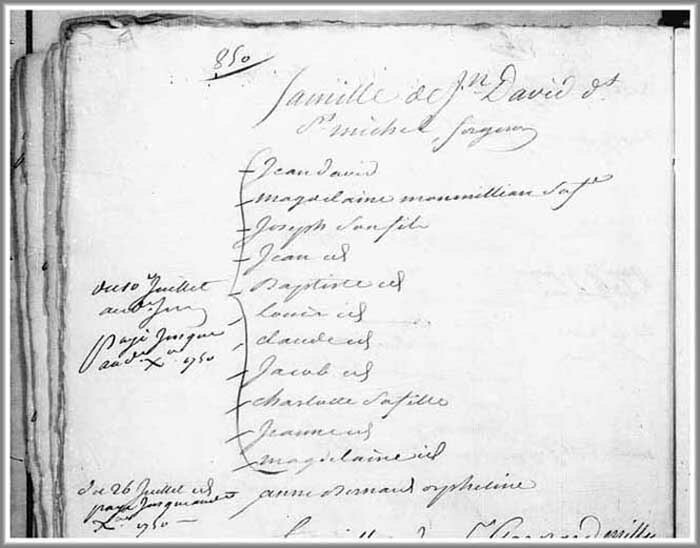 Louis' documented presence in Louisbourg is recorded in a Family Reconstitution File of his father, Jean Pierre David, which is archived at the Fortress of Louisbourg National Historic Site of Canada. This Family Reconstitution File was abstracted and compiled from original source documents archived at the Archives of Canadian and the Archives Nationale. Further documented evidence which notates Louis in Louisbourg during this period has been extracted and compiled from original source documents into the Fortress of Louisbourg Historical Memoranda Series 1964 to Present H F 25 1989 titled Jean Pierre David dit Saint Michel: Blacksmith authored by Eric Krause of Krause House Info-Research Solutions. 1. Jean-Louis, a son born at Saint Pierre on 14 December 1767. He died at Saint Pierre on 28 November 1787. 2. Marie Angelique, a daughter born at Saint Pierre on 12 June 1770. She died at _________ on _________. 3. Jean, a son born at Saint Pierre 18 September 1772. He died at _________ on _________. 4. Antoine, a son born at Saint Pierre on 10 June 1774. He died at _________ on _________. 5. Claire Marie, a daughter born at La Rochelle, France on abt 1768. He died at _________ on _________. 6. Louis, a son born at La Rochelle, France abt 1767. He died at _________ on _________. 7. George, a son born at La Rochelle, France on abt 1776. He died at _________ on _________. 8. Jeanne Francoise, a daughter born at La Rochelle, France on abt 1779. She died at _________ on _________. Copyright © 2009-2012 Davids of New France. All rights reserved.